If an embankment is built on weak subgrade, pore waters in the subgrade are forced to leave by the load, consolidation takes place and the bearing capacity of the subgrade increases. In case of quick construction of the embankment, this pore water pressure is suddenly greatly increased and causes a hydraulic soil break under the embankment and the constructed embankment slips apart. Embankment foundation is necessary to prevent this type of failure to occur on weak subgrades. To prevent the slipping apart of the embankment body some kind of reinforcement needs to be installed at the bottom of the embankment that will hold it together along the embankment toe. The following figure presents a summary of various embankment foundation methods recommended by Gradex Ltd.
A built geocell is a set of rectangular isosceles triangles made by placing one metre wide uniaxial geogrids vertically on their edges. The built geocell structure is constructed by placing uniaxial geogrids on their edges and connecting them. First two grids are placed parallelly with 1m distance then a further run of geogrid is used between them to form rectangular isosceles triangles. The built geocell is 1 m high. The triangular cells thus created are filled with a granular filling material with low sill content that has a grading that does not require compacting. The cells are overfilled by 10 cm. 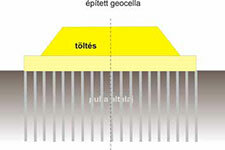 Embankment foundations using geocells provide a structure with considerably higher stiffness that those using multilayer geocells, thus the settlement of subgrade under the embankment will be approximately 10% less. A structure designed using subgrade parameters, the weight of embankment and its working together with the geogrids and the tensile strength of the geogrid. By default biaxial or triaxial geogrids are used, but for higher loads it may become necessary to use uniaxial geogrids placed perpendicular to the axis of the embankment. Geogrids may be placed at a spacing of max. 40 cm, because in layers exceeding this thickness the arching of aggregate filling material occurs. The solution is acceptable if consolidation in the various phases is not excessive, because the elasticity of the embankment foundation with multilayer reinforcement fully copies the settlements pertaining to the embankment height. This embankment foundation does not reduce settlement. 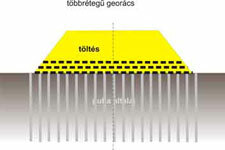 Gradex Ltd. mostly built embankment foundations with a single geogrid layer. Soil mixing is done by a rotating mixer installed on an excavator which can mix the subgrade to a depth of 6m. Depending on the composition and consistency of the soil cement or lime injection is used. The objective is to improve the condition of the treated and mixed soil to quality. Cement stabilisation can also be used which results in a stronger and stiffer structure than the soil. The settlement of treated soil mass can be well controlled and due to the higher stiffness of the structure a much lower overall settlement can be expected. Gradex Ltd. undertakes the stabilisation of very weak soils, which may also be inaccessible, using mixing and injection, from the design to implementation, up to a depth of six metres. This is a new technology in Hungary only recently introduced, so only foreign references are available. As we can see, controlling the consolidation of subgrade under the embankment is inseparable from embankment foundation. Today’s accelerated constructions over weak soils sensitive to settlement require the controlled acceleration of consolidation of soils under the embankment. The rate of settlement can be well controlled by the use of vertical drains. These “pipes” installed vertically in the soil allow the drain of excessive water caused by the increase of porewater pressure to quickly leave and a final equilibrium pressure to evolve. In the knowledge of the physical properties of the soil Gradex Ltd. can make a proposal, based on exact calculations, on the acceleration of consolidation and also undertakes the implementation.